As much progress that has occurred in Amarillo, Texas, in recent years, there remains much work to do to restore, revive and rejuvenate historic landmarks. To that end, a former hospital campus on Amarillo Boulevard and Polk Street just might become the next big triumph in the city’s long-term redevelopment strategy. Or … it might not. I will hope for the best. A newly formed non-profit group has taken possession of the old St. Anthony ‘s Hospital complex. 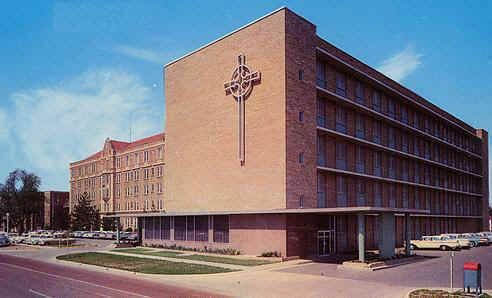 The hospital closed many years ago when St. Anthony’s merged with High Plains Baptist Hospital to create Baptist-St. Anthony’s Hospital in the midst of the city’s growing medical complex along Coulter Street in far west Amarillo. It has fallen, dare I say it, into serious disrepair. I got a first-hand look at it just a couple of years ago while writing a feature story for KFDA NewsChannel 10’s website. The then-owner walked us through the campus and, to point it candidly, it wasn’t a pretty sight. The place is crumbling. That statement might need a bit of translation, given the rather broad and nebulous nature of its content. Emeny’s organization hasn’t yet revealed any details of what it intends for the old campus, or how it proposes to pay for whatever it will do. I have known Mary Emeny for a number of years and I fully understand and appreciate her love of Amarillo and the Texas Panhandle. I am never going to doubt her ability to achieve whatever she seeks to do. The Amarillo Globe-News named her its Woman of the Year some years back. I do not believe her energy and her commitment have abated one bit. I wish my friend well. That old campus needs a lot of work. I have faith Mary Emeny will deliver the goods. Previous PostIG report steers clear of ‘collusion’ probeNext PostThis is how you ‘unify’ the country? No way!